Fears over the economy’s copper dependence persist. Zambia’s economic record has been favourable, with a doubling of copper output prior to the crisis, and robust medium-term projections; however, its narrow export base remains a key rating negative. Data for 2011 suggests that copper accounted for 77% of export receipts, leaving Zambia vulnerable if copper prices should decline. We are mildly bullish on copper, anticipating a recovery in 3M LME prices to USD 8,500/t by end-Q4-2012, and an average price of USD 8,875/t for 2013; nonetheless, as noted below, key metrics might be affected by a sustained downturn in copper. Despite a doubling in the rate of copper-related royalties to 6% in the 2012 budget, copper’s contribution to the overall tax-take is minimal. Generous development agreements secured by many mine operators when they first invested in Zambia, and the ability to carry losses forward, have meant that to date, only one mining group operating in Zambia pays a significant amount of corporate income tax. According to the 2012 budget, mining taxes (royalties and tax arrears combined) accounted for 11.8% of total domestic revenue, and only 9% of the total available resource envelope. Although any sustained slump in copper prices would affect activity more broadly, with implications for revenue collection elsewhere in the economy, the direct contribution of mining to the fiscus remains small, and much below the sector’s weight in GDP (c.30%). Contingent liabilities of the public sector, identified as a key fiscal risk, and potential spending overruns in the event of the authorities having to put into place greater social safety nets, would have to be watched. 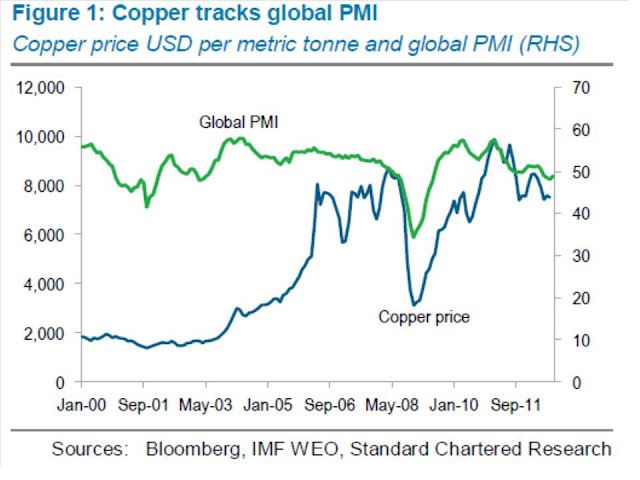 Nonetheless, immediate fiscal risks, even in the event of a 20% decline in copper prices, would likely not be extreme. The impact on Zambia’s balance of payments is likely to be more severe. Projected trade data for 2012 from the latest IMF Article IV report, which uses a copper price assumption of USD 7767/t (compared with a year-to-date average price of USD 7970/t), suggests that despite a small current account surplus, Zambia’s total exports are sufficient to cover imports only 1.3 times. Although some of Zambia’s import bill is likely to be impacted by mining activity (which might slow in the event of weaker copper prices), IMF data indicates that oil makes up only 8% of Zambia’s goods imports (little further breakdown as to what constitutes imports is available from official sources). In the event of a downside global shock that weakened copper prices, Zambia’s exports would be vulnerable, but it is conceivable that its import bill might not weaken that much, leaving the country’s external balances weaker. With Zambia’s import cover estimated by the IMF to be only 3.3 months (our own projections suggest four months), the ZMK would be vulnerable to any correction in copper prices. For Eurobond investors, however, near-term cyclicality in copper and local currency volatility are unlikely to be immediate concerns.